It has been a glorious two weeks for Korea's Son Won-ho as he swept to the men's singles title in the USD250,000 Gwangju Korea Masters in Gwangju on Sunday to add to the Yonex Hong Kong China Open he won on Nov 18. At the age of 30, Wan-ho ranked sixth showed that he is far from over after his back-to-back titles although the former world number one has been somewhat erratic in his badminton career. 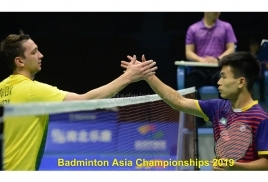 In the Hong Kong China Open final, he downed Japan's Kenta Nishimoto 14-21, 21-17, 21-13 after a marathon 90 minutes. However, it was a much easier final at home in the Gwangju Korea Masters for Son-ho as he used his vast experience to beat Malaysia's upcoming 20-year-old Lee Zii Jia in straight games 21-16, 21-11 in 36 minutes. Despite the defeat, Zii Jia still walked tall in Gwangju since his return from a back injury which kept him on the sidelines after winning the Chinese Taipei Open in October. It was also a remarkable show from China's former world number one and 2012 London Olympics gold medallist Li Xuerui. She had a long layoff from competitive badminton following surgery for anterior cruciate ligament (ACL) and meniscus which she sustained in the 2016 Rio Olympics. Xuerui held off compatriot and number eight seed Han Yue for a 21-10, 21-18 win in the final for the women's singles crown - her third this year - although she played with a heavily bandaged left leg in Gwangju. Korea also swept the men's doubles title through Choi Solgyu-Seo Seung-jae who upset number eight seeds Po Li-wei-Wang Chi-Lin of Chinese Taipei 21-12, 17-21, 21-18 in a 55-minute final. The Koreans also reigned supreme in the women's doubles which was an all-Korea affair. Third seeds Chang Ye-na-Jung Kyung-eun defeated unseeded Lee So-hee-Shin Seung-chan 21-14, 21-17 . The mixed doubles was another all-Korean affair with Ko Sung-hyun-Eom Hye-won needing three games to prevail 21-12, 15-21, 21-18 against Choi Solygyu-Shin Seung-chan after an hour-long battle.